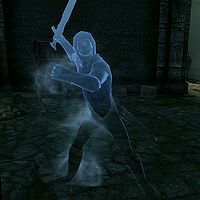 Sanctuary Guardians are the Nordic ghosts of former Dark Brotherhood members destined in the afterlife to guard the halls of the Dawnstar Sanctuary. They will be unleashed by Cicero in an attempt to stop you during The Cure for Madness. This Sanctuary Guardian specializes in close combat and has a leveled sword of the best possible quality at his disposal (up to Daedric quality at level 46). He wears shrouded armor with matching boots, gloves and a cowl. In combat they will have several unique lines, saying: "You dare invade this Sanctuary? ", "Fall before the will of Sithis! ", "Unworthy! ", "You are not welcome here!" and "You can't kill what's already dead, mortal." 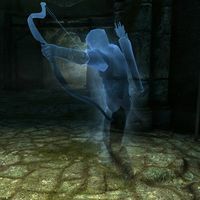 When defeated, their last dying words will be: "Father..." or "Precious release..."
This Sanctuary Guardian specializes in ranged combat and has a leveled bow at his disposal, along with 25 leveled arrows. When confronted directly he will battle you with a leveled dagger. All items are of the best possible quality, up to Daedric at level 46. He wears shrouded armor with matching boots, gloves and a cowl. The Sanctuary Guardians are members of the Forsworn class, which determines the level of their skills. This page was last modified on 11 September 2016, at 18:55.